Major Robinson, 26th Battalion AIF commander, was not only responsible for the capture of Mephisto on 22 July 1918, but was instrumental in its delivery to Queensland as a war trophy. 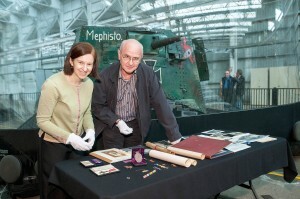 Queensland Museum Network CEO Professor Suzanne Miller met with the family at Mephisto’s temporary home at The Workshops Rail Museum to accept the donation. 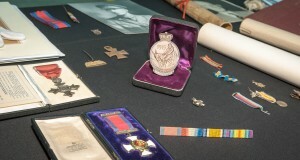 Professor Miller said Major Robinson’s family had very generously agreed to donate several items of significance, including his medals, to the Queensland Museum collection which already contains his uniform. The donated items include Major Robinson’s military medals with supporting documentation, the presentation scroll from his Distinguished Service Order, photographs and other important documents. A small Mephisto display at The Workshops Rail Museum gives visitors an insight into the tank as well as the specialist conservation treatment and techniques used to store such a large and precious metal object, with Mephisto now kept in a balloon-like cover called a carcoon. Queensland Museum curators are planning a new exhibition to commemorate the ANZAC Centenary.